Even when it rains, there are idiots like me who go to the beach. Just because it’s the only day that’s free or it’s a good time to go anyhow. 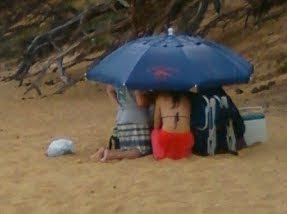 People will tolerate even rainy weather on Maui! And one secretly hopes that the sun will come out, because half the time it does, and the clouds clear. There’s no way to be really sure of the weather at Makena because it’s a different micro-climate than the rest of Kihei. I call it the "Makena Cloud." It's a big dark cloud that sometimes hovers over Makena State Park, both Big Beach and Little Beach. Yes, you can really get rained out on the beach! The Makena Cloud in action. It can be sunny in Kihei, even at Po’olenalena Beach just a couple of miles up, and raining buckets at Makena. Or the opposite. Sometimes Kihei gets rain – imagine that! And Makena is clear as a bell. It's a paradox! Overlooking Big Beach (Oneloa) on a cloudy day. In Haiku, on the north shore of the island, it’s often rainy but just down the road, perfectly sunny and nice. And paradoxically, it can be raining elsewhere and unbelievably, be sunny in Haiku. The sun is trying to break through! Kaho'olawe is in the distance. Usually if you drive far enough, you can escape the rain. It’s island geography, and the weather’s not like on the mainland. A puka (Hawaiian for hole) in the clouds. See! There's blue sky above. C'mon sun! And there are hardy souls who still hope the rain will go away and it'll be a good beach day. Hope is priceless. If we're lucky, the rain does go away. If we get rained out, scurrying under damp towels and soggy umbrellas, at least we won't melt.